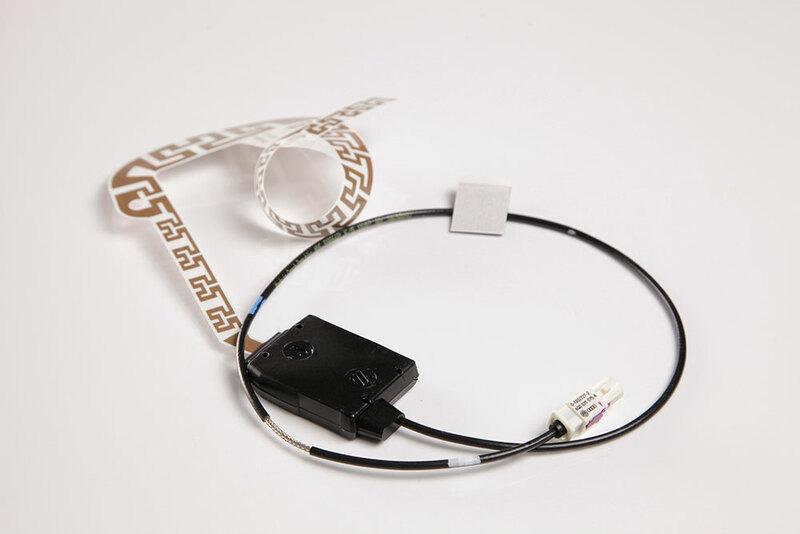 We are the only company authorised to use Fractal Antennas® in automotive applications. 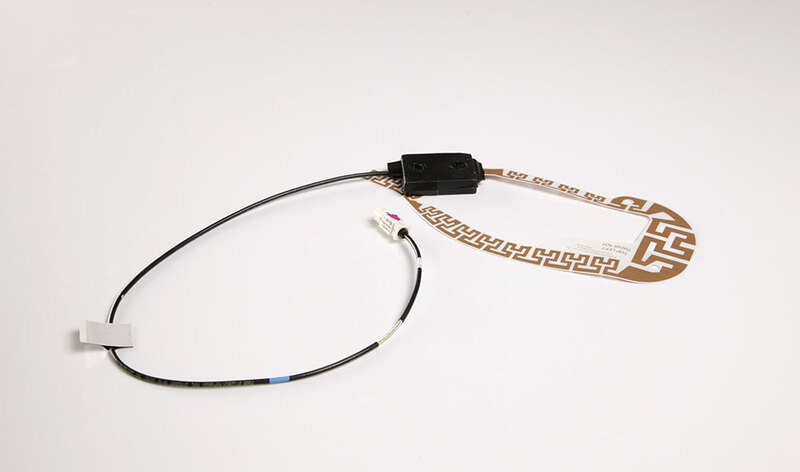 FICOSA is a leading developer of integrated antennas in the motor industry. 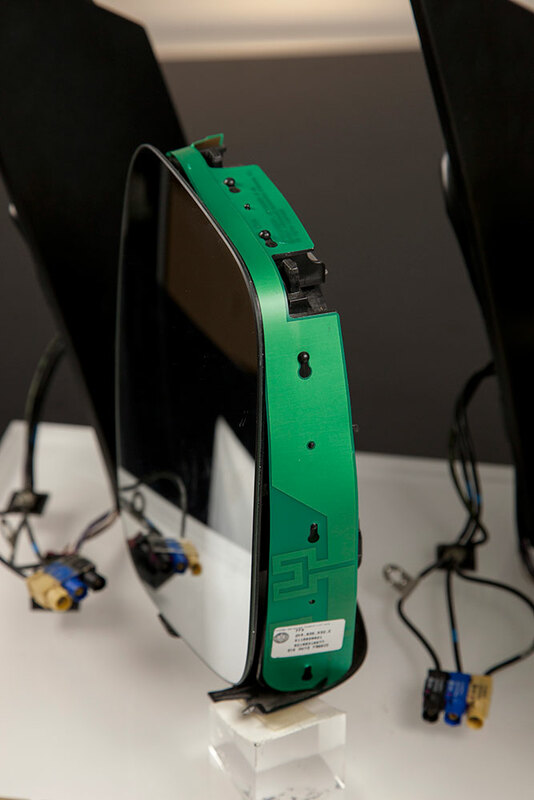 Ficosa, as the only company authorised to use Fractal Antennas® in automotive applications, leads the way in the design and development of innovative antenna systems based on fractal technology for the vehicle. 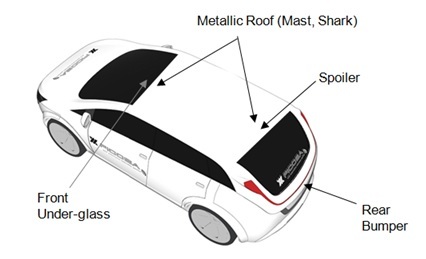 Based on proprietary technology for multiband and miniature antennas through multilevel and space-filling properties, the applied technology, available on all types of substrates, allows the aerials’ integration in different locations in the vehicle. 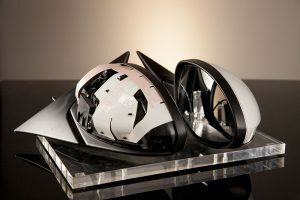 A growing number of services in modern vehicles set limits for conventional aerials and physical and aesthetic demands set boundaries for car designers and developers. 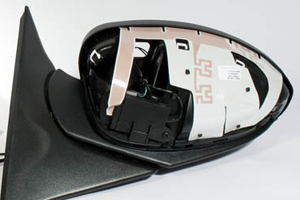 Innovative and approved technology enables antennas for a variety of services to be integrated into one single module, the rear-view mirror. 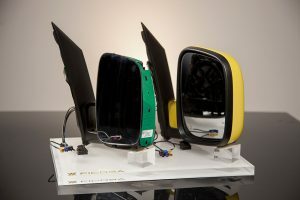 Frequencies such as AM, FM, DAB, TV, RKE, Wi-Fi, Telephony, and GNSS are examples of production programs with antennas integrated into exterior mirrors. 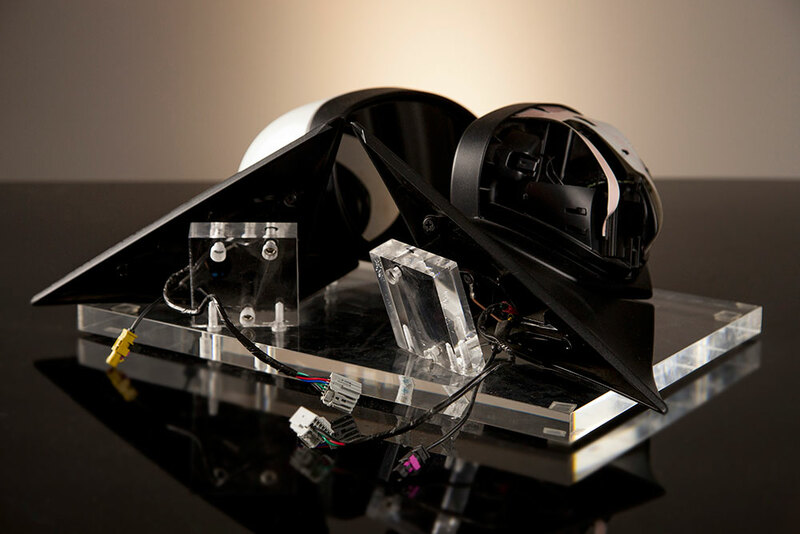 Style– completely invisible antenna solution, no impact on design. 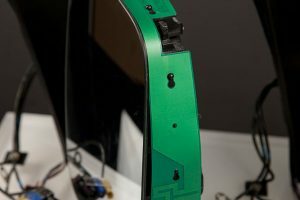 Process cost for OEM – antenna delivered in mirror module, no extra assembly cost. 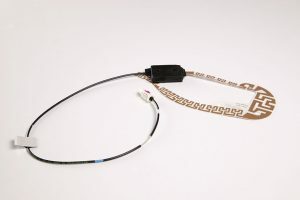 Reduced cable length and easier cable routing result in a reduced cost and weight reduction for the OEM. Aerodynamic – no additional air drag, results in reduced CO2 emissions. 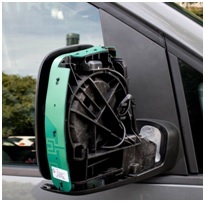 Customer benefit – antenna is not exposed to external forces (vandalism or carwashes). Performance – Phase/Switch diversity solutions offer omnidirectional radiation pattern typical of mast aerials. 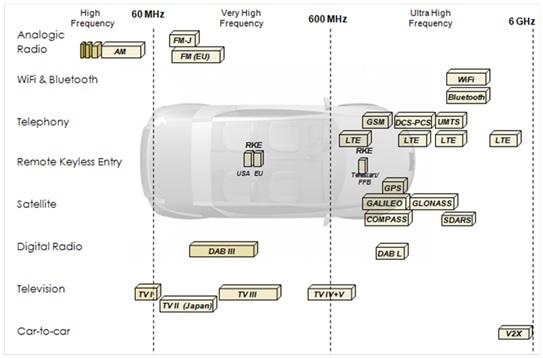 Standardisation – one antenna layout for a complete model range (hatchback, estate, coupé, convertible). 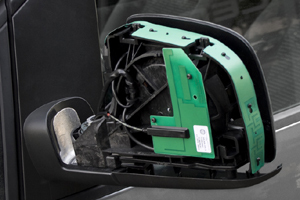 SDARS and GPS patch antenna solutions to be integrated into vehicle plastic boots. 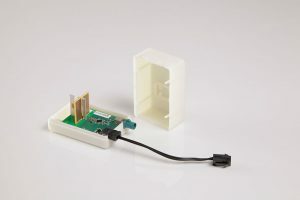 Telephony/Wi-Fi/GNSS Antenna Module covers telephony LTE 700/2600, GSM/UMTS 850/900/1800/1900 and UMTS 2100 bands; 2400 MHz WI-Fi band, and the GPS/GLONASS/BEIDOU/GALILEO/EGNOS/ QNZSS bands. 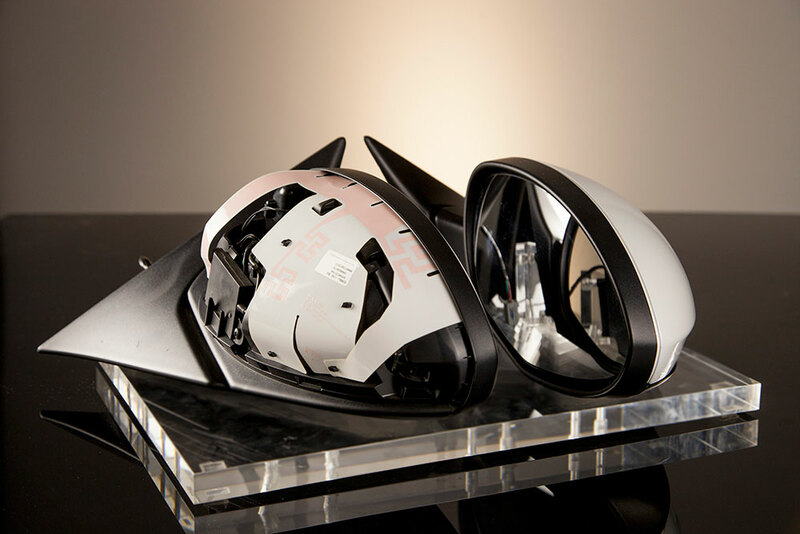 The design assures good performance for each service and good isolation between services. Specially conceived for applications where the antenna has to be in a protected environment (i.e. dashboard of the vehicle). Antenna module does not need additional metallic ground plane underneath the vehicle. Stand-alone solution. 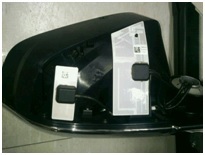 Easy integration and installation in the vehicle. 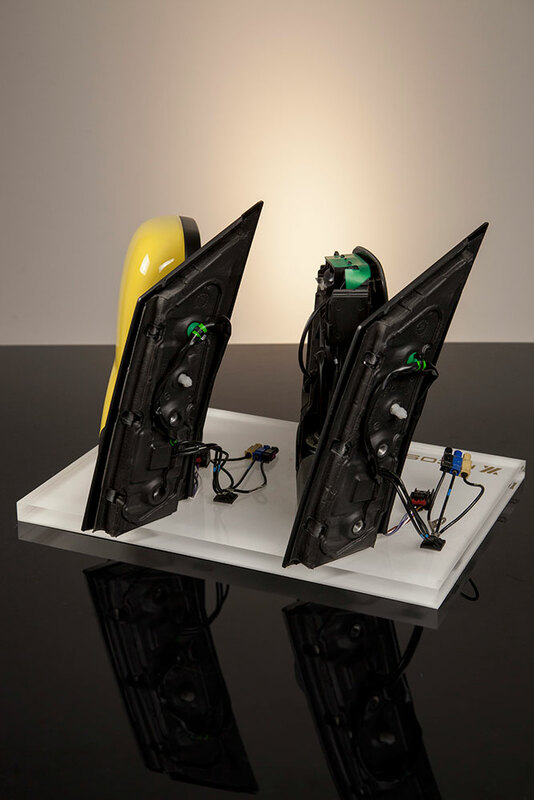 The Directive V2X Antenna covers the 802.11p standard for dedicated short-range communications between vehicles (DSRC) and infrastructure elements. The design assures the reliability installation in different locations in the vehicle without performance reduction and with an excellent interoperability with other wireless devices, due to having an independent ground plane. 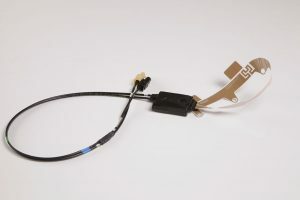 The Compact Broadband Telephony Antenna covers all the telephony services for 2G/3G/4G as a worldwide telephony antenna. The design assures good performance for each service, including LTE services (4G) with excellent matching and gain in a reduced size. Specially conceived for applications when a low profile external telephony antenna is needed. Antenna suitable for different locations (i.e. dashboard, bumper, etc.). Miniaturisation due to space-filling properties. Antenna module does not need additional metallic ground plane on the vehicle. Stand-alone solution. Telephony, GNSS, Wi-Fi, V2X antennas integrated inside Ficosa telematic and communications modules.